Unless a project you make out of plywood is just going to be used in the garage, you’re probably going to want to finish it in some way. There are many ways of finishing plywood, from painting it to applying laminate. Which you choose will depend on what you’re making and how you intend to use it. Of all the possibilities, painting is the simplest and less expensive finish you can apply. Painting also gives you the opportunity to add color, which is great for kids rooms or accents throughout the rest of the house. But you want to give it a good paint job, because poorly painted plywood looks like nothing more than… poorly painted plywood, whereas well painted plywood can look great. Any good paint job starts with preparing the wood. That means filling holes and sanding. Even low cost construction plywood can be made to look great, with the right sort of surface prep. If you’re making furniture out of plywood, you’re probably going to want to use a high-grade plywood, such as a cabinet grade or a sanded plywood. But for the sake of discussion, let’s assume that you aren’t using that and have instead made your project out of construction grade plywood. Can you still get a good finish? Yes; but it takes more work. Typically, nail holes, knotholes, cracks and other irregularities are filled with wood putty, but that’s not the only material you can use. Both drywall mud and spackling can be used to fill and surface plywood and provide a smooth finish. Drywall mud is especially good if you are using C-D grade construction plywood and want a smooth surface. Keep in mind that any wood filler you use, whether wood putty or drywall mud is going to shrink some when it dries. So don’t be surprised if you have to apply more than one coat. In that case, you’ll want to sand between coats, with 120 grit sandpaper, so that you are applying the second coat over a smooth surface. Be sure to sand the ends of the boards too, as they will often be rough. When applying drywall mud to plywood in order to smooth it, you’re better off using a 10” to 12” taping knife, just as if you were spreading the drywall mud on drywall. It is especially important to fill edges of plywood, as most plywood will have some voids. Filling also allows you to fill in end grain, providing a smooth surface for painting. If your project is going to be used outdoors, you might want to fill the edge with painter’s caulk, rather than wood putty, so that you can seal the end grain and keep moisture from wicking into the plywood. Finish sanding of plywood should be done with 240 grit sandpaper. It is not necessary to use anything finer, as the paint will smooth the surface. There are a large variety of paints which can be applied to plywood. 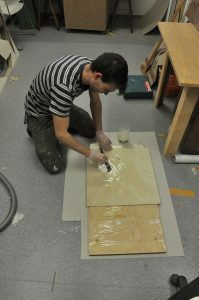 For most projects, water-based acrylic-latex paints are easier to work with. However, if you want a semi-gloss finish on your project, you will need to use an acrylic enamel and if you want to have a high-gloss finish, you will need to switch to an oil-based paint. Both enamel and oil-based paints require a primer coat, before painting. Semi-gloss and gloss finishes are easier to clean, making these paints ideal for use on furniture and shelves used in children’s rooms, as well as kitchen and bathroom cabinets. Flat or eggshell finishes don’t clean as easily. For extreme durability, epoxy paints are excellent, although they are expensive. This is actually a low-viscosity two-part epoxy compound, tinted for use as paint. Once mixed, you have a limited work time. But you will end up with a much more durable coating than you can get with any other type of paint. Always use quality paint to get the best finish. Higher quality paints have more solids in them, which results in a thicker, more durable finish. They also tend to cover with less coats. While you will always need to use at least two coats of paint on a new project, with high quality paints that is all you should need. You may choose to prime your plywood project or not prime it. Primers are used to seal the surface of the wood. Unlike paint, they won’t soak into the wood as much, but will rather seal off the grain. At the same time, primers promote bonding between paint and the project you are painting. Some of the newer high-quality acrylic-latex paints are a paint-primer combination, eliminating the need for a primer. If you are going to paint your project with a latex enamel or an oil-based paint, you definitely want to prime it first. Enamel paints do not dry well, when applied directly to wood. So the primer acts as a barrier, allowing the paint to dry properly. Applying any primer coat is as important as applying the finish coat. You want to apply the primer smooth and evenly, so that you don’t leave any drips, puddles or streaks. The texture of those irregularities will show through the finish coat of paint. Always brush in the direction of the surface grain, using long, smooth strokes. After your primer dries, always check your project, before painting. It is not uncommon for flaws in the wood or lack of putty in holes to show up after the primer dries, that you couldn’t see before. If these problems occur, merely add more putty, sand the affected area again and touch up your primer. As I already mentioned, the first step to getting a good paint finish is how well you putty and sand the project, before you start painting. Every imperfection in your surface will show up as an imperfection in the paint. Don’t think that your paint can fill in those imperfections, because it can’t. If anything, it will magnify them. Using the right type of brush is important to getting the best possible finish. Only use quality brushes, if you want good finish. For latex based paints, a nylon brush is the best and for oil-based paints, china bristle is best. China bristle is available in black or white bristle, allowing you to pick a brush with a contrasting bristle color to your paint. This makes it easier to see if you have properly cleaned your brush. Always plan out the pattern of your painting, before beginning. Many projects work out so that you have some parts that are harder to reach, than others. Those are the ones you want to paint first, leaving the easier to paint surfaces until last. You want to try and avoid reaching over a freshly painted surface, in order to reach something you missed. With plywood, it works best to paint edges first, and then paint the larger flat areas. That way, if you end up with a drip or sag, it is more likely to be on the edge, where it is less visible. Those drips and sags are extremely visible on the large flat areas that plywood projects typically have. Use a wet brush to paint, not a dry one. The idea isn’t to see how far you can stretch the paint, but rather, to see how much paint you can get on the surface, without getting to the point of having the paint sag or drip. Keeping a wet brush will ensure that you are putting a thick coat of paint on the surface. Paint only in the direction of the wood’s surface grain. If you need to go across the grain for some reason, brush over that spot in the direction of the grain, to minimize brush marks. Always figure on having to apply two coats of paint, taking the time to do each of them carefully, with ample drying time between coats. Check the project, between coats, for any drips and sags. If there are any, they can be removed by sanding or with a razor blade, allowing you to have a smooth surface for the final coat. One great trick to save paint on large projects is to have your paint store tint your primer. With a high quality, high solids paint and a primer that is tinted to be close to the color of your paint, you can usually get away with only one coat of paint over the primer. Adding Floetrol for water-based paints or Penetrol for oil-based paints helps the paint to “flow,” smoothing out the “grain” that the brush produces and making a more uniform finish. Proper use of these additives can make the brush marks totally disappear in the finish. When painting to the edge of a piece of plywood, always paint past the edge, rather than stopping your brushstroke at the edge. Stopping at the edge will cause paint to puddle there. Check after painting, to ensure that you didn’t leave a drip around the corner. Proper cleaning of brushes is extremely important. If you clean your brushes thoroughly after each use, there is no reason why a brush can’t last you 10 years or more. I have some brushes that I have owned for more than 20 years, and am still using.